These awesome doors have a heavy duty 1-1/4 inch tube construction. No drill application means easy on and easy off for trail days or whenever. Heavy duty frame provides exterior protection yet ventilation. 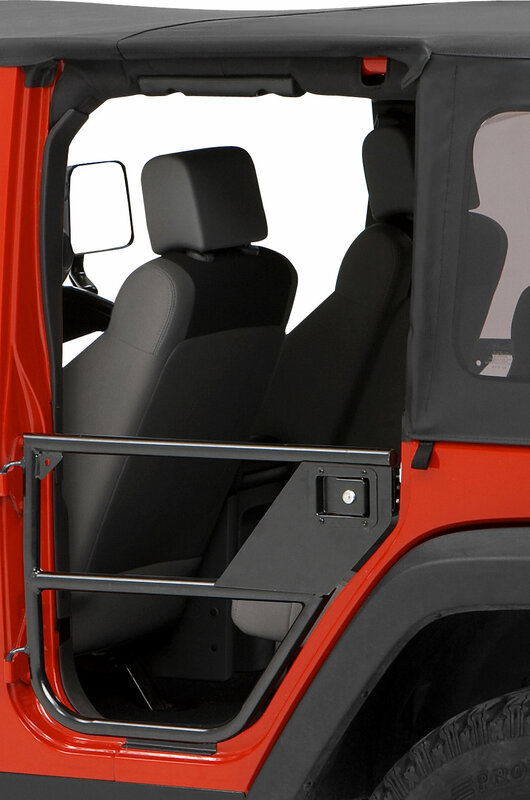 Kit converts the Element™ Door and can be left black or painted match to original Jeep® color. New optional Upper Door Sets make the Element Doors a Complete Door for protection from the cold! Ready for adventure? HighRock 4x4 Element Doors are safari-style tube doors that provide fantastic on-trail visibility, protection, and enough options to match your vehicle and your style. Heavy-duty 11/4" tube construction provides exterior protection, yet ventilation. Easily accepts OEM and Bestop Replacement Mirrors with a no-drill application. Optional heavy-duty storage pockets can be positioned for easy access inside or outside of vehicle. Optional door Enclosure Kit is made of steel – and is paintable for a color matched finish. Attaches to Element™ Door with locator pins and bolts. No drilling required. Optional Element™ Upper Doors offer a snug fit for versatile full doors when you need them.